Daniel and Vala's plans for an evening out are interrupted when Vala is suddenly abducted from the restaurant. She awakens to find herself strapped to a gurney, the prisoner of Charlotte Mayfield of the Trust. In fact, Charlotte is the Goa'uld Athena, once the rival of the Goa'uld Qetesh. As the former host to Qetesh, Vala may hold the memory of a code to an Ancient tablet, and as SG-1 desperately searches for their missing teammate, Athena and her fellow Trust operatives prepare to subject Vala to the excruciatingly painful process of retrieving the memory they believe will lead them to the Clava Thessara Infinitas - the key to infinite treasure. SG teams raid the warehouse where Vala is imprisoned, but in the ensuing shootout, a zat blast causes a power surge in the memory recall device. Vala escapes, but with no memory of her identity. Confused and alone, she comes upon a diner where Sal, the soft-hearted owner, offers her a job as a waitress and a place to stay. Her past returns to haunt her, however, when two armed thugs attempt to rob the diner, and Vala, acting on instinct, easily overpowers both of them. Detective Ryan investigates the robbery, but he becomes suspicious of Vala's vague answers and issues a bulletin for her identification, a bulletin that is received by both the SGC and the Trust. Trust operatives arrive at the police station moments before SG-1 and take custody of Vala. Mitchell pursues on a motorcycle, but his attempted rescue goes awry when he is shot in the arm and becomes Vala's prisoner, handcuffed in a hotel room. 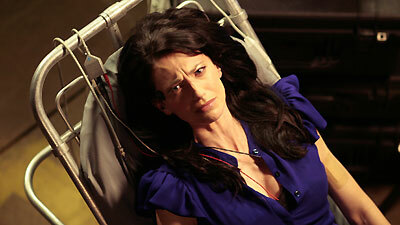 Vala finds his explanation of aliens and abductions hard to swallow, and she sets out on her own once more. The team locates Mitchell, and SG-1, Vala, and the Trust converge on a warehouse. As a shootout rages, Daniel confronts Vala, and flashes of memories begin to return. Vala has come home. Back at the SGC, there is one more surprise awaiting her - team badges. Vala has become an official member of SG-1. Westminster Boiler & Tank Co. According to legend, the Clava Thessara Infinitas, or "Key to Infinite Treasure," will allow he who possesses it entry to a vast storehouse of riches hidden away by the Ancients prior to their ascension. Athena, the Greek goddess of war, was a minor player who rose to mid-tier status by pursuing alliances with more powerful rivals such as Cronus, Camulus, Svarog, and even Anubis when he was first banished by the System Lords. She and Qetesh were once rivals, but they allied to search for the Clava Thessara Infinitas. They never found it, but Qetesh double-crossed Athena and wanted her to think she had. Athena believed her, and used Ba'al's resources on Earth to go after Vala. Vala is now officially a member of SG-1.